Some of you may have noticed that my posts are going up later than usual. That’s because the disease, Old Woman’s Back, has returned with a vengeance. I’m not sleeping very well, and it has put my whole system off kilter. I’m not working this week, missed two out of my three days last week. When I called to make an appointment with my pain doctor, I was told they couldn’t get me in until the 20th, this coming Monday. I asked if the doc would renew my scrips in the meantime, and was told that he would not do that because it’s been so long (over a year) since I’ve needed them. I have just enough pain pills to get me through to Monday if I take them only once a day, usually before I go to bed. So I’m hurting, and my life has once again gone off the rails. I’m sure the doctor will send me for another MRI, since that hasn’t been done in at least two years. Now, it’s time for me to practice what I preach. Being thankful is paramount, because if I don’t focus on the things for which I’m thankful, I will be flooded with resentment, anxiety, and fear. Yes, fear. I don’t like pain, and I know this condition is not going away. The symptoms can be treated, but they cannot be cured. So. If you are a praying person, please add me to your prayer list. Prayer is still the best healer. It happens to nearly everyone, sooner or later. There are over 100 different types of arthritis, ranging from the most common, “wear and tear” variety to the more unusual, like ankylosing spondylitis. The most commonly-known and experienced is osteoarthritis, the one we know as “wear and tear” arthritis. It comes as a result of the every-day use of joints, especially in the hands. 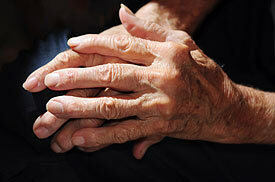 To me, there has always been a particular beauty in a pair of old hands that have been useful and that show their age. Busy, helpful, hardworking hands are nothing to be ashamed of. The problem, of course, is that pain accompanies arthritis. It can be mild, occassional discomfort or it can be daily, debilitating pain that keeps us from doing the things we most enjoy. Since I was about ten years old, I’ve loved every type of handwork like crochet, embroidery, cross stitch, and knitting. I still enjoy it, but I have to be careful about my favorite, knitting. It hurts my hands and my elbows and shoulders if I stay in that position too long. So my knitting projects take a lot longer now than they used to. Arthritis can affect any joint. I’ve had both my knees replaced. Friends have had hip replacement. It’s amazing what can be replaced these days–knuckles, shoulders–pretty soon they’ll find a way to replace my brain! These technologies are truly amazing, and can give years of pain-free living that our parents and grandparents did not enjoy. Arthritis, though, is something most of us just have to learn to live with. The most effective things for pain relief differ from person to person. I find that typing and playing the piano actually relieve the pain I have in my fingers. Mobility is important, To keep moving is vital, not just for pain relief but so that we don’t become invalids much sooner than we have to. There are all kinds of snake-oil options out there, so be careful what you spend your money on. If it seems too good to be true, it probably is. The con artists among us focus on the elderly sometimes, promising miracles that never happen. Be wise and cautious. Physical therapy is wonderful. It can help restore range of motion and give relief from pain. Warm water pools are a gift from heaven, relaxing sore muscles and joints while you do exercises specifically designed to increase strength and mobility. Some people find their arthritis is worse in cold weather. Personally, I am far more uncomfortable when it’s very hot and humid. I’m beyond thankful for air conditioning! Those who are thinking about moving to dry places like Arizona for relief from arthritis might want to be aware that in excavating the dwellings of ancient native Americans in those desert climates, archeologists have found bones that show severe arthritic conditions existed back then, in the hot dry climates. What works for one might not work so well for another. Be careful about popping pills. You can wreck your stomach and your liver with too many pain meds. You need to work with your doctors to find what is best for you. There is tons of information about all sorts of arthritic conditions on the internet. Be careful about what you read. A lot of it is perfectly reliable. Some of it is not, because it’s put out there by people who want to sell you their miracle cures. Arthritis is unavoidable. It’s part of aging. There is help; there is pain relief. In my opinion, the most important treatment is attitude. The more we complain and cry about our pain, the worse the pain feels. Do what you can for relief, and keep moving. Keep your outlook off yourself as much as possible. Your life isn’t over because you have some sort of arthritic pain. Some are far more debilitating than others; most of us do not experience the worst forms of arthritis. There are no miracle cures. There are medications and treatments that can bring relief. The most important thing is to keep moving, eat well, rest well, and stay positive.